m-est participated in the inaugural ArtInternational fair that took place last week at the Haliç Congress Center. During the fair, we made a mini survey connected to our current issue, which revolves around the concept and execution of public art or art in the public realm. We had a simple question: What is the most immediate question, artwork, institution or exhibition that comes to your mind when we say public art? A big thank you to the friends and colleagues who shared their thoughts. And special thanks to Özkan Cangüven who invited us to participate in the Alternatives section at the fair. We’ll be publishing the answers to this survey over the next few days. Since 5533 was selected as a spot in the biennial, I’ve been continually thinking about 5533’s relationship to the public and how public it is. Since the last week when the biennial opened, I realize that people really had to go out in the public to find us. They had to ask questions—especially foreigners—trying to figure out where we are, they had to walk, and it’s been a real adventure for many of them. Our doors are always open, we are totally organic. We open, we close, but whatever we do is open to the public—to whoever comes. In that sense, we are public. 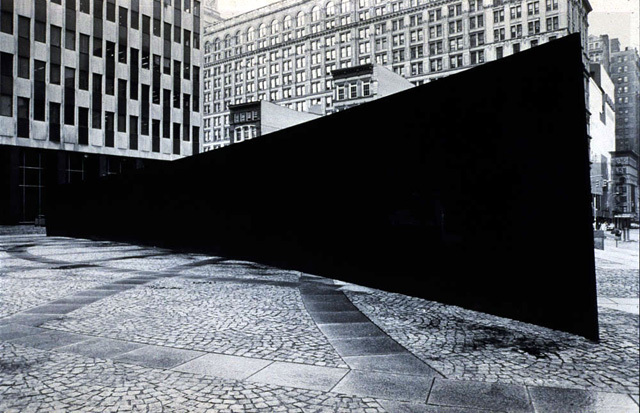 I think about the art of Richard Serra when you mention the term “public.” Tilted Arc from 1981, Serra’s large-scale sculpture in the middle of a public park in New York City, is a great example of an artwork that first surprises you and then offers you a routine. It also caused a lot of protests because people working in the area argued that the sculpture disrupted their daily routines. This is how I think about public art—an intervention that makes people think and change their way of living, their routines. The first artwork that came to my mind was Olaf Metzel’s 13.4.1981 from the 80s. A huge sculpture made of police barriers and a shopping trolley, which became a kind of iconic image. A second work that is very subtle is Selin Kocagüncü’s Vending Machine, an event that she staged in 2008 in Belgrade. There, the artist offered a glass of water to the passers-by in exchange for making her smile. Does public art occupy a tangible space? Is the Public a space or a group of people? When I think about public art I think about its problems, but rather than calling them problems, I should name them conflicts. When an art piece gets situated in a space for a designated amount of time, how is its involvement or indifference viewed or experienced? Does it allow for the chance to observe what puts the art and the public together? And what are some of the outcomes of this partnership? How much of this partnership makes the work a public art? How much of this partnership is the public art? I think public art stimulates the audience to talk about what the public is, what the definition of public might be, what public space and public conversation might mean, and what the commons might mean. For me, this term refers to any kind of art or stimulus that engages the audience to think about all these words in an expanded sense, from the historic to the present. Posted in content, on artists and tagged 5533, Özkan Cangüven, Kristina Kramer, Lara Ögel, Nancy Atakan, Polistar, Richard Serra, SPOT, Suzanne Frijling, Zeynep Öz. Bookmark the permalink.